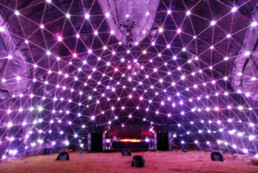 What makes up the inside of the Harvest Crash Dome? A whole lot of addressable LED pixels!! These are truly impressive in person. Lumatronic specializes in production fabrication, interactive structures, and memorable event experiences. Partnering with organizers, stage designers and artists, we aim to push contemporary lighting design forward.